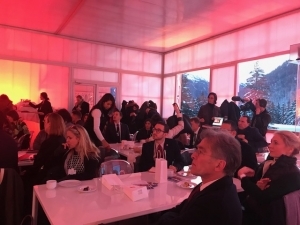 On the first morning of Davos 2019, the ICEhouse hosts a panel breakfast discussion and livestream on the changing face of humanitarians. Some of the conversation highlights include how the humanitarian mission is changing, why civil society must reclaim the humanitarian space, and the desire for localization in humanitarian aid,. Participants include Tara Nathan, EVP, Humanitarian and Development at Mastercard, Peter Maurer, President, International Committe of the Red Cross, Peter Laugharn, President and CEO, Conrad N. Hilton Foundation, Rob Acker, CEO Salesforce.org, Jérôme Jarre, Founder, Love Army, Mayuri Bhattacharjee, Founder Sikun Relief Foundation in discussion with Heba Aly of IRIN News. "We are living in a transformational society that connects us in a different way"
"People help themselves and are their own first responders" - so the mission is evolving to how you connect and empower people on the ground to lead. The humanitarian sector is finally recognizing this and at least at the policy sector want to empower on the gorund organizations. How can the relationship between private sector and non-profit NGOs evolve to operate better in a world where the risks and challenges are larger than ever? From the perspective of on the ground organizations like Sikun Relief Foundation, they are looking for cooperative efforts, visibility and the ability to translate activity into action - evidenced by donor arrogance, where donors do not take the local organization seriously enough. Working with women - often in a crisis solutions are imposed from top down, and women can be excluded from these decisions. Social enterprises play an important role in mitigating this and are one of the agents of change in achieving better humanitarian results. How is the philanthropic community engaging in more in fragile states? From the Conrad Hilton Foundation perspective they are looking at points of leverage in the system, so they can do more good - for every dollar spent, how can they provide more than a dollar of help. "We need a system that is able to deal with the new challenges" because the structure of humanitarian work is actually old, and not geared toward the challenges that exist today - climate change, or large scale movements. Speed is also key, foundations on their game can move quickly to deploy resources that assist complex emergencies and fragile states. The challenge here is due diligence, because grant making was done annually vs on a real time basis. There has been a lot of discussion about getting money to individuals, but more discussion needs to happen about getting money to local organizations to help the deliver last mile aid. One of the conversations in the new humanitarian space is about flipping the power structures to enable local economies to better manage these shocks. This localization trend is led by investment, in particular social impact investment. The challenge for the investment community is that they are not familiar with the risks - which can be quite scary. While impact investors want to invest in these areas because they are most in need, there is still a journey in getting investors and impact investors involved. Nevertheless, top down structures are slowly being replaced by bottom up approaches. From another angle there is a principles question in humanitarian space about what the rules are for engaging, and on the humanitarian space - Jerome Jarre of Love Army maintains that a lot of the main "industry" of humanitarians are great people, but the 'system' of humanitarian is not functioning effectively. Love Army is working with the Rohinga in camps, where the tensions in the camp revolve around distributed efforts to scale help, including cash handouts, with the older structures of aid organizations that are considered professional. Collaboration can't be a concept, says Tara Nathan, how do we bring together core competencies from the new volunteers and the professional organizations that are on the ground work. In the future, I would like to see a world where we all consider ourselves humanitarians. Jerome sees a future with the status quo where we end up with hundreds of millions of refugees, or we innovate, and the creative genius of artists is missing in the humanitarian sector - the creative genius of artists - the best hope is in something that does not exist yet. Mayuri talks about the tyranny of distance - the media and the world don't see much of what happens - in Assam India, every year more than 1.5 million people are affected by flooding, but the world doesnt even notice. She too is hopeful innovation will be the tool that helps to solve these issues. Rob is looking at how to scale assistance through data and information to assist collaboration between the organizations delivering assistance. The system's success is determined in the end by its ability to serve the people most in need. 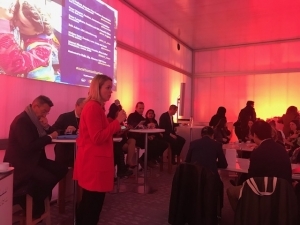 There is a tension between the traditional world of humanitarians and the new world of humanitarians, together its putting humanitarian work at the heart of this year's Davos agenda.